These plates allow the removal of the entire secondary air injection / combi valve system, including the large injection pump on the front of the engine. This results in a much cleaner looking engine bay, as well as less clutter and more room for you to get in there and wrench on your ride. We CNC machine these plates from 6061 aluminum alloy, and machine them to accept an O ring seal, so that they seal up perfectly with no fuss, and no gaskets or messy sealant. The installation is completed with our included aerospace grade Viton O ring, and stainless steel socket head hardware. 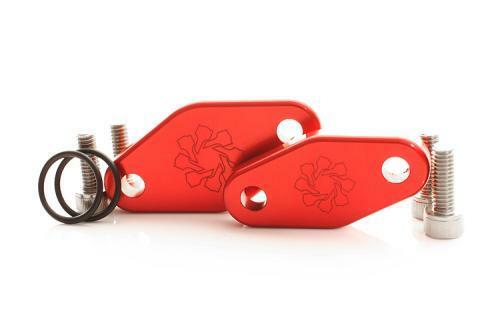 This is a complete kit, which includes both blockoff plates, o rings, and mounting hardware! Note about check engine lights: There are two codes which may come up for this, one can be solved by adding a resistor to the circuit for the soleniod control valve, the other- for "incorrect flow detected" can only be defeated by software!